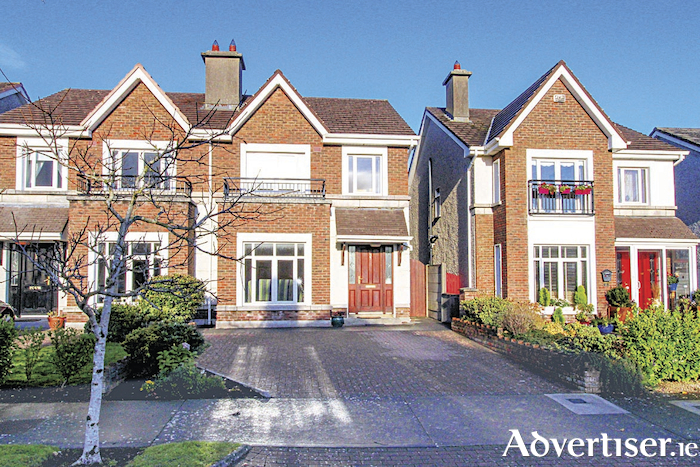 Number 33 Caiseal Cam is a spacious owner occupied home situated in a highly desirable O’Malley-built development in Roscam. The property is larger than similar homes in the development with an increased first floor area offering four spacious bedrooms, three of which are double bedrooms and two are en suite. The residence has been well maintained and is presented in excellent decorative order. Notable features include gas fired central heating, PVC double glazed windows, two en suites, built-in wardrobes to the bedrooms, and a block built shed to the rear. The accommodation comprises hall, spacious living room, kitchen, dining room, utility room, guest wc, four bedrooms (two en suite ), and bathroom. Outside, there is a brick paved driveway to the front with off street parking, and to the rear is an enclosed low maintenance garden with block built shed. Caiseal Cam is regarded as one of the most desirable residential developments on the east side of the city. It is exceptionally well maintained with beautiful green areas and landscaping throughout. The development boasts a convenient location close to Galway Clinic, Merlin Park Hospital, Briarhill Shopping Centre, Parkmore, Ballybrit, and local shops, and offers easy access to the M6 Galway/Dublin motorway. The property is ideally positioned beside a lovely park which includes basketball court, tennis court, playground, and large green area. Viewing is highly recommended for those seeking a home in this well established and sought after development. For full details see www.mulleryauctioneers.ie or call Mike Mullery of Mullery auctioneers on 091 567275 or 087 6424106.